It was a different time in 1974, when Master Gunnery Sgt. D. Michael Ressler joined the Marine Corps. President Richard Nixon was about to resign, Commandant Gen. Robert Cushman had recently overseen the Corps’ withdrawal from Vietnam, and Hank Aaron had just become baseball’s all-time home run king. Thirty-nine years later, Ressler will leave the Corps this month with more time on active-duty than any other enlisted Marine. A member of the “President’s Own” U.S. Marine Band, he will be honored in a retirement ceremony at Marine Barracks Washington on Friday, and officially retire Aug. 31. He served under 11 Marine Corps commandants. 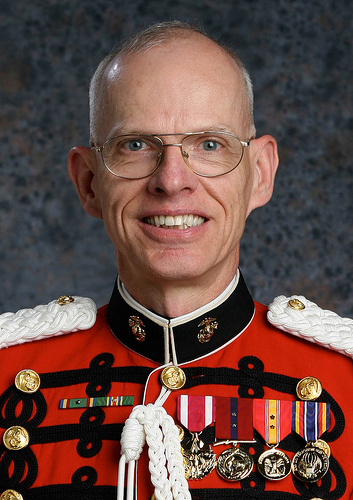 Ressler, 61, initially joined the Corps as a music librarian with the band, after finishing second in an audition with the euphonium, a brass horn. Just a few weeks later, however, another opening appeared for a euphophonist, and Ressler began performing with the band, he said. He was promoted to his current rank on Dec. 1, 1990, he said — meaning he served nearly 23 years as a senior enlisted Marine. Master Gunnery Sgt. 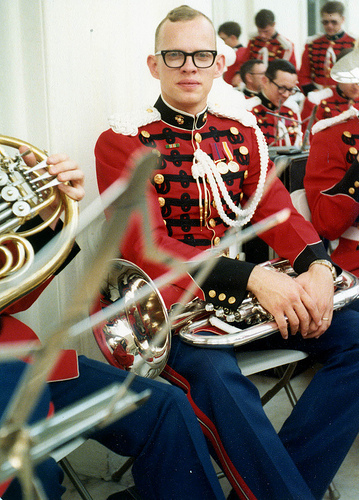 D. Michael Ressler, as a euphonium player in the “President’s Own” U.S. Marine Band in 1978. Ressler recalled several highlights when asked to reflect on his career. In 1976, for example, he said the band made a cross-country tour spanning 51 days to mark the country’s bicentennial celebration. In 1986, he played aboard the battleship Iowa and aircraft carrier John F. Kennedy as President Reagan marked the 100th anniversary of the Statue of Liberty’s unveiling. The band’s music was choreographed with fireworks. More recently, Ressler became the band’s chief librarian in 1988, and its historian in 2008. He has spent much of the last few years conducting interviews with current and former members of the “President’s Own” to develop an oral history. Ressler said he and his wife, Susan, plan to retire to their hometown of New Holland, Pa. A community band there is active with youth, and he’d like to help. “The President’s Own” played my son to his grave at Arlington. Thank you. I will never forget walking behind the caisson and band as we moved down the hill, past thousands of graves… The band played “Onward Christian Soldiers”; how fitting as my son was killed by Jihadists. God bless America and our fighting men and women, especially our United States Marines. Thirty-nine years of service and it looks like from your uniform that you never deployed. Obviously, you have been milking the system and playing in a band rather than being a rifleman like the other 99.99% of the USMC! Master Gunnery Sergeant Ressler, Good luck in your retirement. Thank you, for your musicianship with the President’s Own. Ok…good on him…I guess….just wondering how an enlisted man got to serve 39 yrs and beat High Year of Tenure rules when others get forced out of service…I realize E-9’s can be waivered to 33 yrs but even that is a hard sell….39 yrs! c’mon…I guess it pays to play an instrument for the corps. Hey there Scalia… 99.99% of the Marine Corps are rifleman, correct. However, many musicians also deploy. Some of them rate combat awards and even more wear a CAR. Do you? Are you a Marine? I’ll bet not, because by your inference of 99.99% ‘rifleman’ remark you don’t know what you’re talking about. Very little of the Corps are infantry. And I’d bet you could find plenty who have been in that haven’t been on combat pumps. As for serving for that long… Refer to the Mother’s comment. Remember many veterans get a tape recorded version of taps, or some fake bugle that’s electronic. When we are lowered into our grave it won’t matter to us of every note is perfect, as played by a Marine, but to those left behind there’s no amount of anything that can replace those moments of pride and patriotism. To you people leaving negative comments, you do realize that members of “The President’s Own” are enlisted differently, right? Most of them enlist as an “E-6” I believe, and their rank symbol features a musical symbol rather than the traditional cross rifles. They do not go to boot camp or deploy, but they are serving their country by being part of one of the best groups of musicians in the world. Do some research before being such a negative Nancy! Well said, Stomping. Congrats on the long career Gunny. Not sure this exactly belongs on “Battle Rattle”. I respected his accomplishments but still question why someone who didn’t go through boot camp and EARN the title of Marine can be called a Marine and also a Master Gunnery Sgt. If you look at the video, he is not wearing a special insignis, he is wearing a Mater Guns chevrons with the bomb in the middle. I just don’t feel he rates. For the record, I am a Sgt. of Marines Wpns Company 3/5…..RAH! Many people do not realize how hard it is to be in “The President’s Own.” They are the best of the best musicians that the Corps has to offer. Many musicians do deploy as rifleman, gunners, drivers, etc. Musicians are also used as litter carriers in many battles throughout history. They play at funerals, parades, even overseas to bring a break from war time. The enlistment process is completed at the applicant’s local Military Enlistment Processing Station. A standard four-year enlistment contract is signed “for duty with the Marine Band only.” Marine Band musicians are permanently assigned and may not be transferred to any other unit or location. Upon enlistment, new members are appointed to the rank of Staff Sergeant (pay grade E-6) in the United States Marine Corps and receive all pay and benefits commensurate with that grade. They are also subject to the Uniform Code of Military Justice, the rules and articles governing the discipline of the U.S. Armed Forces. So in other words they cannot do anything but be in the President’s Own and yes they are still Marines. Hate the game, not the band player. Mauricio is correct. The members of the regional Marine Bands are the Marines you may have seen deployed. They did not enlist under terms of the Presidents Own. However, like the Presidents Own, they must pass band auditions, but enlist under the Music Enlistment Option Program (MEOP) administered by the recruiting districts and complete the Armed Forces School of Music after they complete SOI. That is not an easy thing to do at all! Some MEOP Marines do in fact audition and gain acceptance to the Presidents Own too. Music in the Marine Corps is alike to bullets and bayonets to a rifle. Both sound SCHWEEEEEET whey they are rolling..! Thank you for the 39 years of service but band member do not go to boot camp, they join the band as SSgts, and they wear different chevrons. Not the same as the rest of us. To those that say this Marine milked the system because he never deployed, he was part of the President’s own. They are not riflemen they do not deploy. They are professional musicians that audition to join the band and never go to bootcamp. When they “enlist” for their first four year contract they start at the rank of staff sergeant (E-6). They do not even have cross rifles on their chevrons because they are not regular Marines. These people are just professional musicians that get to wear a Marine uniform. to those that think he is wearing a normal MGySgt chevron on his uniform, he is not. He has a harpsichord instead of a bursting bomb in the center. Please learn alittle about the Marine Corps before bashing this man and his service. The only Marines that can wear the uniform but do not have to deploy or go to boot camp are “The Presidents Own”. They should not be confused with the band members that serve at each base. The band members at each base do go to boot camp and do deploy. Other unique attributes to “The Presidents Own” is that they have college degrees in music, and are extremely talented in music. They audition for their position and they do not wear the cross rifles on their uniform because they are not a basic rifleman like the rest of the Marine Corps. And to Master Guns Ressler, thank you for your amazing service and Semper Fi! There is a difference between Band members and The President’s Own. TPO enlist as E-6 and play only for the President (hence the name), they do not deploy, they do not attend boot camp, qualify with a weapon, or take the pft. They have a Lyre instead of crossed rifles on their sleeve. While the TPO are greatly talented musicians, that is all. Band members on the other hand are actual Marines. Please don’t insult a Marine by confusing the two. Scalia. Should change that l to a b. You proved your ignorance immediately. 99.9% is BS, if you served you would no that. This guy promoted the Marine Corps in an honorable fashion, and deserves kudos for that. Congrats Gunny on a great career! The President’s own are civilians in uniform with all the great benefits of military personnel yet never PCS or serve overseas or war. They start as E-6 pay, the same as a GS-11. The best deal in the nation, earning 2.5% in retirement pay rather than 1.0% as a civilian state dept employee, which they should be. This why they all love the band. They are not Marines since they never went to boot camp. Let’s shed this burden from the Corps rather than combat units.